We are a licensed brokerage handling the leasing and purchasing requirements of the medical community. The leasing requirements of medical office buildings are unlike those of other commercial space. A successful medical office building usually results from a carefully orchestrated tenant mix, involving appropriate ratios of medical practitioners, specialists and service providers like laboratories, pharmacies or physical therapy clinics and radiology. In today’s market, renewals are the most cost effective key to the financial viability of a building and they ensure the continued support of the service tenants. PAR-Med has the specialized experience and knowledge to ensure the right mix of tenants and services is achieved. Medical building owners must contend with a host of issues that are specific to this particular asset class. One of the most onerous is the cost of carrying vacant space. This is all the more important given that the market for available doctor tenants is low growth. For information on available space, please see our properties listing. Our expert staff have the ability to establish the terms of a new lease or negotiate a renewal to the benefit of both parties. Our involvement in the negotiation on behalf of our clients' alongside the building management allows us more insight into the needs of our tenants. Our standard form of lease is easy to follow yet comprehensive enough to cover all topics with movement to negotiate terms satisfactory to all parties involved. We're active in the medical office leasing market, regularly completing over 300 lease transactions per annum. We have first-hand knowledge of the financial opportunities that medical service tenants derive from being situated in a medical building and work to ensure landlord and tenant satisfaction. This enables our clients to negotiate leases from a position of knowledge. Conduct market surveys to strategize on how to promote vacant space effectively and aggressively thus protecting the value of your real estate. Target advertising of premises for rent. Review leases and prepare lease abstracts for each lease. Advise tenant monthly of changes to rental payments and upcoming lease renewals, options to terminate and review year end adjustments of Operating Costs/Realty Taxes. Negotiate offers to lease for new locations, exercise options to renew, renegotiate renewals. Negotiate with subtenants to sublease excess space under lease and/or convert existing sublease arrangements, including the collection of rents. Prepare and negotiate all lease/sublease documentations. 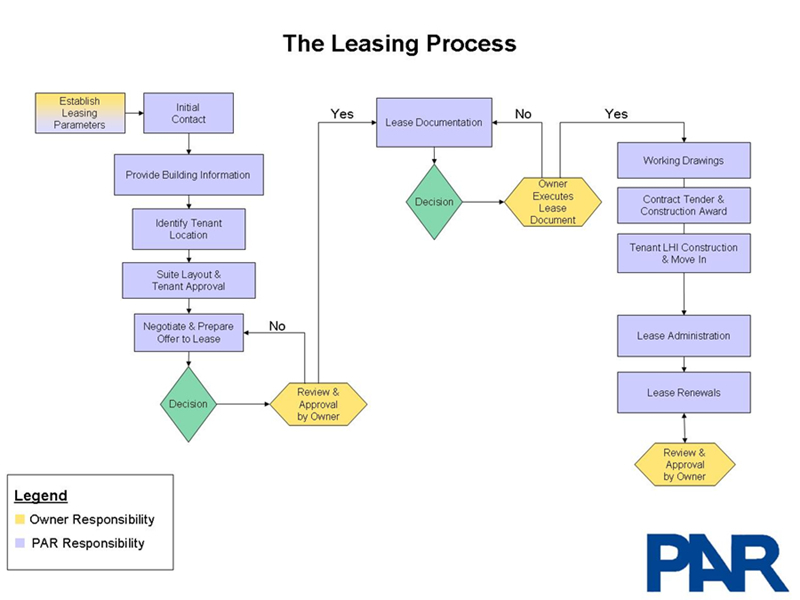 This leasing process diagram was created for hospital-owned properties. Our specialized market knowledge of the operation of medical buildings enables us to represent parties in purchase and sale transactions. With our breadth of experience, we are able to quickly assess the strengths and weaknesses of any given medical building. To ensure full representation in the market place we periodically list properties in conjunction with a major national broker.